Availability: Out of stock - on backorder to be dispatched on or after 06 May 2019. 600mm wide and 600mm high chrome curved heated towel rail with 238 Watt - 811 BTU/h @ Delta 50. 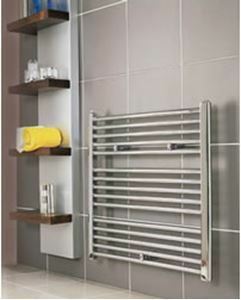 800mm wide and 600mm high chrome flat heated towel rail with 304 Watt - 1036 BTU/h @ Delta 50. 1200mm wide and 635mm high horizontal wavy-shaped anthracite designer towel radiator - 420 Watt - 1433 BTU/h @ Delta 50. 1200mm wide and 635mm high horizontal wavy-shaped chrome designer towel radiator with 331 Watt - 1128 BTU/h @ Delta 50.